The new adaptation of ‘A Series of Unfortunate Events’ on Netflix brings a whole new interpretation of Lemony Snicket’s dark and depressing tale of the Baudelaire orphans to the streaming platform. The story begins small and a little repetitive but grows into a global conspiracy of secret organisations, dastardly villains and intriguing mysteries. The series follows the three equally ingenious and unlucky Baudelaire children, Violet, Klaus and Sunny, after their home is destroyed in a mysterious fire. They are constantly forced to move from guardian to guardian under the sinister eye of the series’ villain, Count Olaf. The new Netflix series gives a fresh interpretation of the Baudelaire’s story, devoting two episodes to each book and covering the first four books in the opening season. The story was always supposed to be episodic, and the new series is structured more like the immersive experience of the original books than a typical tv show. The successful translation from page to screen is partly due to Daniel Handler, pen name Lemony Snicket, leading the writing team with his unconventional and creative flair. The series was first adapted for the screen in 2004, when Jim Carrey led a stellar cast including Meryl Streep and Billy Connolly as some of the orphan’s hapless guardians. The film was a heavy handed amalgamation of the first three books in the series, which swapped and interchanged plot points to squash the thirteen book series into a feature length film. The visuals for the Netflix show are fresh and unique, notably brighter than the Tim Burton-esque gothic look of the 2004 film. No expense was spared by set designer Bo Welch, as every step of the Baudelaire story required entirely new locations. The costumes are colourful and the cgi-assisted machinery visually fascinating. The technicolour look of the series could be compared to cult classic Pushing Daisies, which gained a loyal audience with its colourful costumes and sets which contrasted to the dark and morbid undertones of the show. It is difficult for a generation of fans who grew up with the film, especially Jim Carrey’s extravagant and energetic Count Olaf, to warm up to a new incarnation. 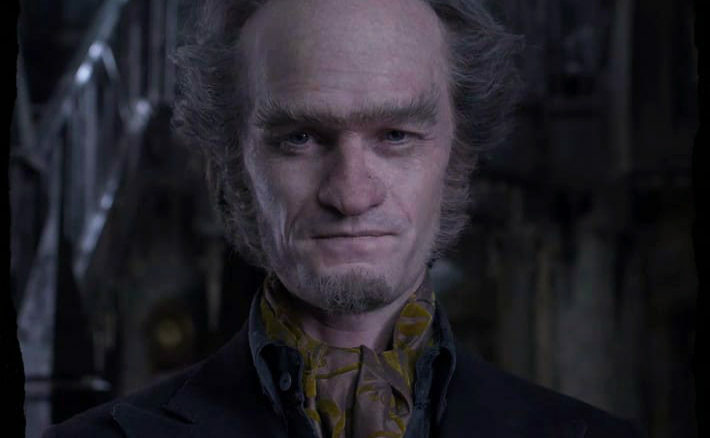 Neil Patrick Harris’ Tony award winning Broadway background is an ideal pick for the overly theatric Count Olaf, who sings more than once in the season. Harris hits the comedic beats of the character with an experienced ease. His Olaf is a quirky and theatrical villain for a kids series but Harris also explores the rare truly sinister moments. A scene in which the angry Count strikes Klaus across the face earns an ominous beat, as well as the creepy plot to marry fourteen year old Violet. Snicket’s unique narrating style is one of the most distinctive elements of the books, and is well translated. Patrick Warburton quickly becomes the only Lemony Snicket you can imagine, delivering droll narration and hinting at his own mysterious history with the overarching secret organisation. He pauses scenes to dryly comment or explain a word to the audience and clever cinematography is used to bring him in and out of frame. Apart from the principal characters of Olaf and the Baudelaire siblings, the cast is notably diverse. Most other significant roles are played by non-white actors, such as Aasif Mandvi portraying lovable Uncle Monty, K. Todd Freeman as Mr. Poe and Alfre Woodard as Aunt Josephine, all played by white actors in the film. Several references are also made to the Baudelaires being Jewish, which Handler made an explicit effort to include. The bar set by the young cast of ‘Stranger Things’ for child actors continues to raise with the delightful Louis Hynes and Malina Weissman as the gifted Baudelaire siblings. The children are given the chance to develop more personality than their movie counterparts, with Hynes playing the studious and occasionally snarky Klaus, and Weissman playing Violet the inventor and oldest Baudelaire. Sunny the baby is cgi-assisted to an almost ridiculous degree in scenes of playing a game of poker and chopping wood with her teeth. The series is expected to gain its wings in season two after it surpasses the span of film, and the audience gets to see the remaining nine adventures on screen for the first time. Although it is difficult for the Netflix series to escape the looming shadow of the film adaptation, director Barry Sonnenfeld has delivered a creative new take on the beloved series.